Nuala Woulfe Beauty: Multimasking - the latest Beauty Trend. Multimasking - the latest Beauty Trend. Multimasking! !The latest trend to take the beauty world by storm is called multimasking -- and it has women from coast to coast mugging on social media to show the secret to a flawless face. So what exactly is multimasking? It’s the practice of using different types of masks on different areas of the face, all at the same time. The resulting patchwork effect may look strange, but experts including Dr. Julie Russak say multimasking makes sense. “The skin on the T-zone where you have the highest concentration of oil glands is very different than the sensitive skin around the eyes. You cannot use the same product on different areas if you want to address those issues,” Russak, a dermatologist, said. “It's applying the right product to the right area on your face so it’s appropriate to all the patients. We all have different skins on different parts of our face. Multimasking is really for everybody." Yahoo beauty editor-in-chief and celebrity makeup artist Bobbi Brown visited “Good Morning America” to give viewers useful tips about how they can make multi-masking part of their routine. 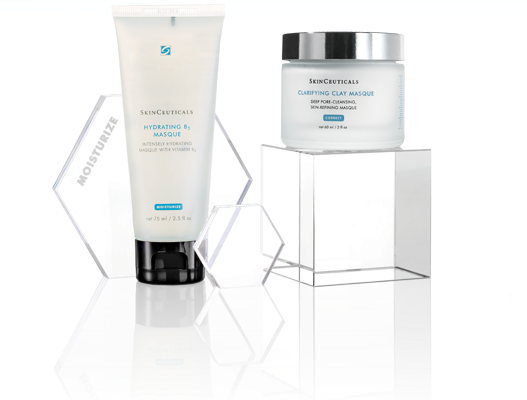 SkinCeuticals treatment masques enhance the results of the rest of a daily skincare regimen. Designed to address excess oil, pore congestion, dehydration, and more, these professional-grade masques are formulated with cutting-edge technology, proven science, and advanced ingredients to yield dramatic skin improvement. Enhanced with a unique complex containing constituents of the skin’s natural moisturising factor (NMF), this weekly hydration treatment re-establishes the water balance critical for maintaining skin metabolic functions at optimal levels. • Apply a thin layer to the entire face in the evening after cleansing. 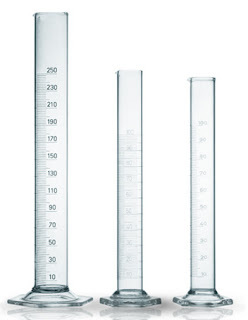 Allow to penetrate for 10-15 minutes, and then gently massage any remaining product into face. 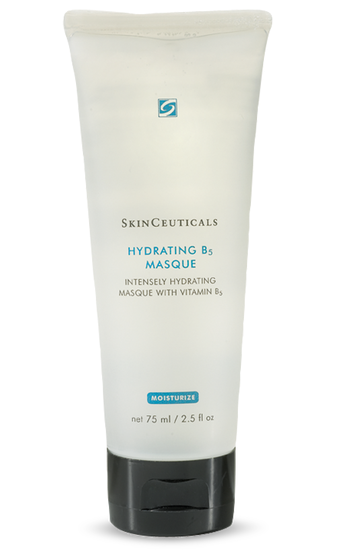 Hydrating B5 Masque can also be used on other dry areas such as neck, chest, hands, knees, elbows, and feet. Vitamin B5: This vitamin is essential for skin repair function. Advanced moisture complex: Comprised of glycerin, urea, sodium PCA, trehalose and polyquaterium-51, this ingredient blend contains constituents of the skin’s natural moisturizing factor (NMF) and helps restore skin’s optimal moisture balance. 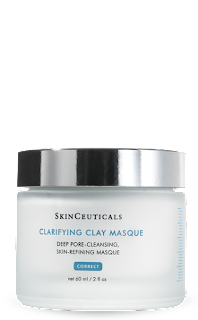 Apply Clarifying Clay Masque on clean face. Leave on for 10-15 minutes. (This masque will not dry hard.) Rinse with warm water and pat dry. 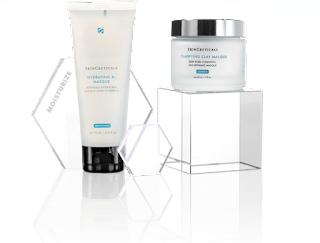 (For optimal results use once a week to help remove buildup of exfoliated skin.). 5% mixed hydroxy acids: This blend of malic, lactic, tartaric, citric, and glycolic acids works synergistically to gently exfoliate dead skin cells. .
Kaolin and bentonite clays: These natural Earth clays help clarify the skin, absorb excess oil and reduce shine..
Aloe and chamomile: With clinically-proven anti-inflammatory properties, this botanical soothes and calms the skin..